Have you ever gotten the completely wrong end of the stick about an author you haven’t read yet? Such was the case with my initial exposure to Banana Yoshimoto, pen name of Mahoko Yoshimoto (in English rather than Japanese name order). 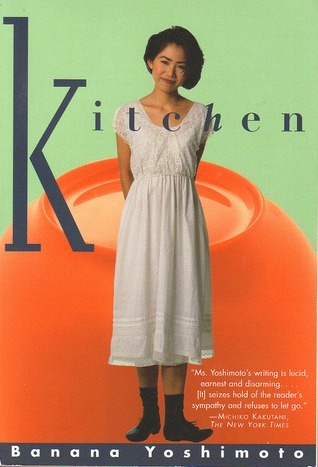 Kitchen was Yoshimoto’s first novel, a novella really, that took a couple of important Japanese literary prizes when it was published in 1988. It was translated into English and arrived in America in 1993, riding a wave of what some clever publicist called “Bananamania”. On the surface it seemed to connect with other elements of Japanese pop culture that had appealed to American tastes as well, like “Hello, Kitty”, manga, and the fun, bright, Japanese fashion phenomenon known as Fruits. Although these were delightful, I wasn’t particularly drawn to reading a novel in this vein. So I let Kitchen pass me by. It wasn’t until Yoshimoto’s novel The Lake came out here in 2011 (Japan, 2005) that I finally had a chance to learn the error of my ways. That quiet tale, in which two lives cautiously come together after experiences of trauma and grief, helped me understand that Banana Yoshimoto’s themes runs much deeper than pop culture typically attempts. Kitchen begins with a young university student bereaved at the loss of the grandmother with whom she lived. Mikage is already an orphan after the early death of her parents, and she is now utterly alone in the world. Having taken time off from school, alone in the apartment, she gravitates toward the kitchen, perhaps associating it with nurturance, and she finds herself sleeping beside the refrigerator. Things can’t go on this way. But they do. As happens so often in Yoshimoto’s fiction, help must come from outside. As characters find themselves in either stasis or a downward spiral, it takes someone clear of the situation to call them back to sanity and reality. One day the doorbell rings. It’s the young man from the flower shop her grandmother used to frequent, virtually a stranger, but one who had helped her at the funeral. He and his mother have discussed it and decided that Mikage should come stay with them for awhile. Having exhausted her own solutions, Mikage agrees to this, although Yuichi Tanabe and his mother are not the most conventional of people. Slowly, Mikage begins to right herself and find her way again. But as the story unfolds, she too will have to help someone facing the abyss. In Yoshimoto’s stories, it is not always immediately clear what must be done. It isn’t usually the straightforward or“reasonable” approach that works. As in a fairy tale, it is by doing the “impossible task”, trusting in unusual guides or spirits, and having the courage to follow the thread of intuition that saves the day. This is, of course, the hero’s journey. If, like me, you’ve previously avoided Yashimoto’s books as being perhaps too slight, do yourself a favor and take a second look.